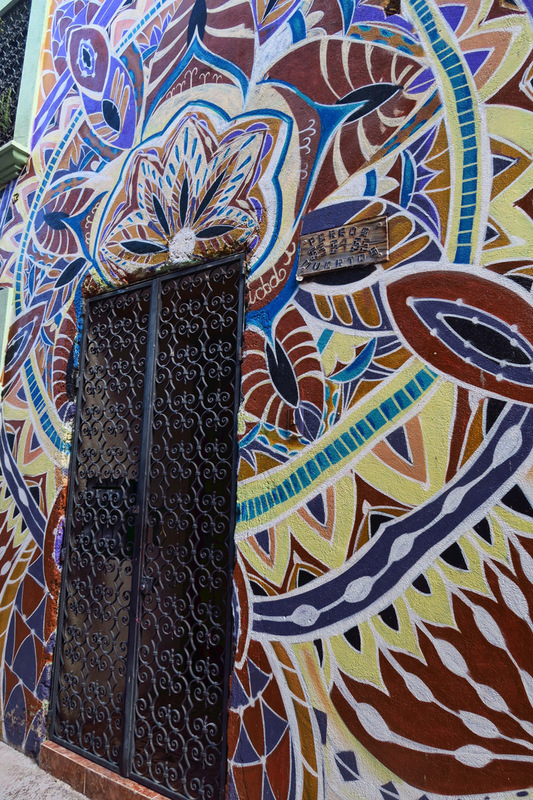 Guanajuato is known for its language schools. Being a smaller city somewhat removed from the heavier touristed locations where English is more widely spoken, it offers more opportunity for immersion without the crutch of English speakers on every corner. 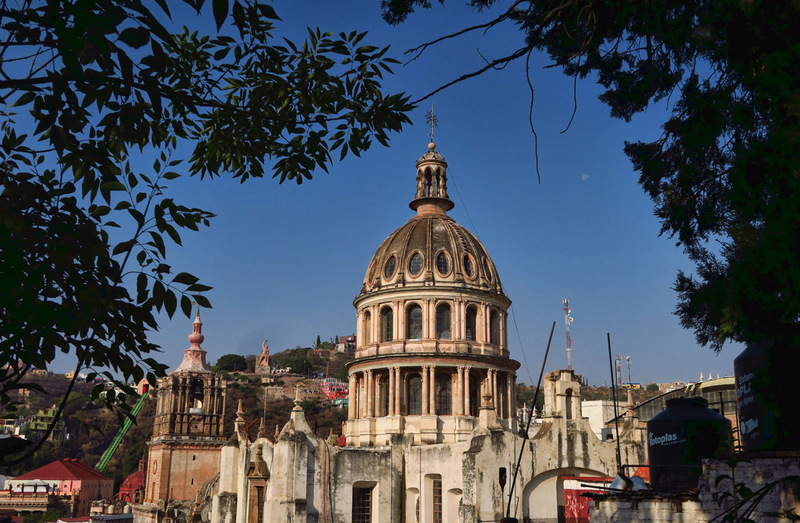 The renown University of Guanajuato with its over 34,000 students also makes for a higher concentration of foreign students than one would typically see in a town the size of Guanajuato, many of them seeking accelerated Spanish immersion. The town manages to support five different Spanish schools in addition to the University’s language curriculum. 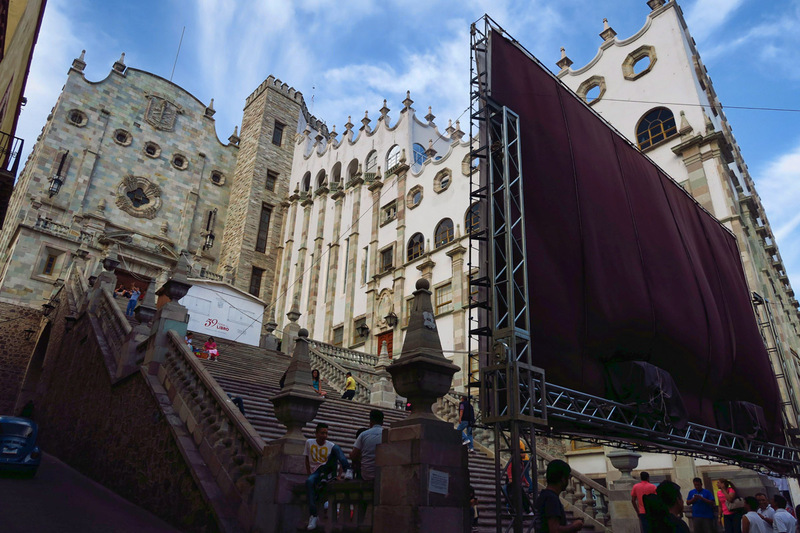 Famous steps in front of the University of Guanajuato. The large screen is temporary, as there is a movie festival going on, so people sit on the steps to watch. 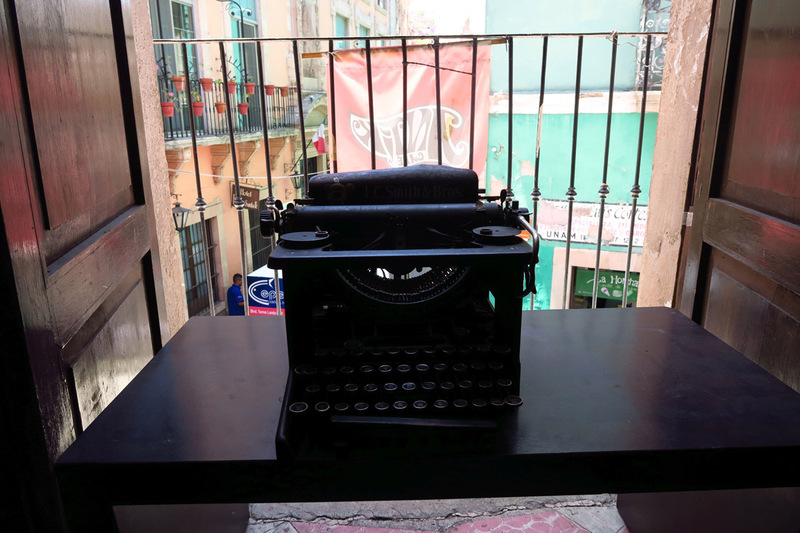 This is the view from the student patio at the University of Guanajuato. 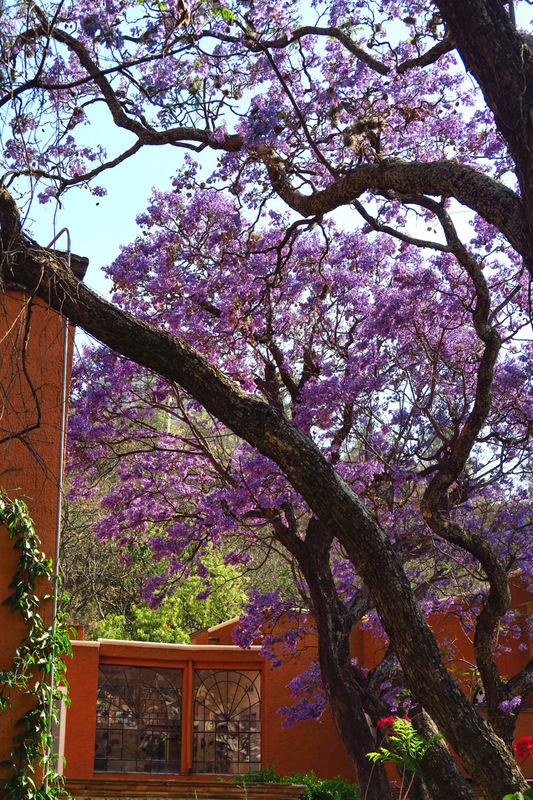 The beautiful purple Jacaranda trees are all blooming when I arrive. Classes all start on Mondays, the day I arrive in Guanajuato. Since I don’t arrive in time to start on a Monday morning, I take a few days to acclimate before starting, particularly since I am a beginner. I use this time to visit the schools in person. Though they all have prices and options offered on their websites, there is no substitute for getting a feel for the atmosphere. I want this to be a positive experience where I won’t be tempted to bail. These are some scenes of my daily commute to school. 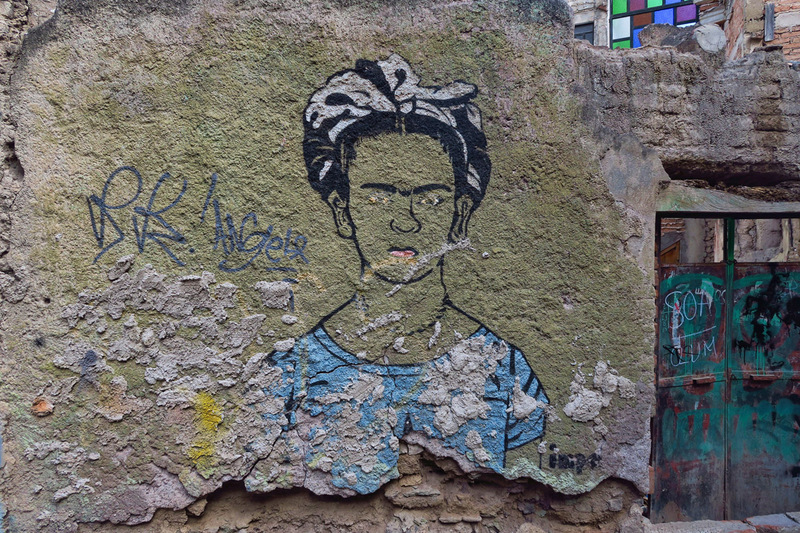 I like this rendition of Frida. Graffiti provides a welcomed landmark when navigating to school and back to the casa. I visit each school to tour the facilities and the classrooms. 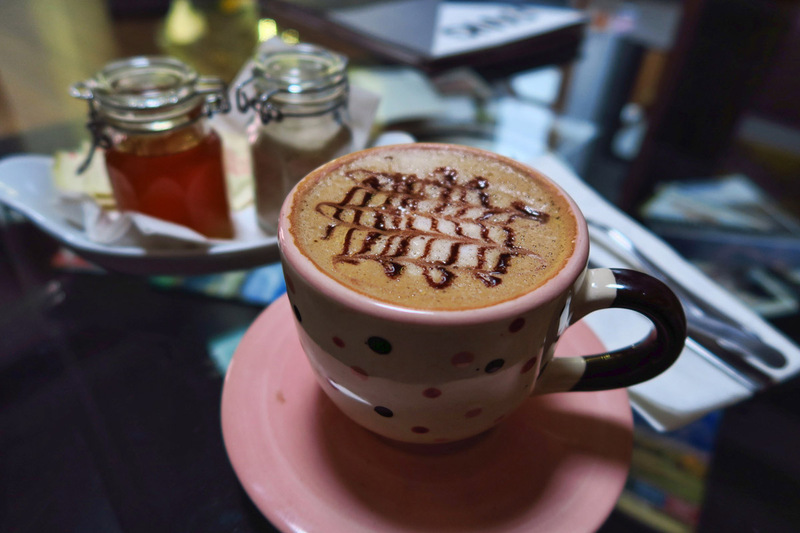 Initially, I lean toward the University, as their curriculum seems more serious, while other schools offer a lot of “fluff” in the form of cooking classes, salsa dancing, etc. I vow I am here to learn SPANISH, not how to cook! This is La Hacienda Spanish School. The young woman is Mariana, my teacher, and behind her is our semi-outdoor classroom. I am in love with the surroundings, but the commute is not so pleasant. Although I am excited about the prospect of learning Spanish, I don’t relish in the thought of starting a “9-5” routine again. Once I retired in 2014, it took me a year to get over that knot in the pit of my stomach on Sunday nights that signaled the start of the work week looming again on Monday morning. For twenty-four years with American Express, it was “Weekdays bad, Weekends good!” But once I retired, just the opposite was true. 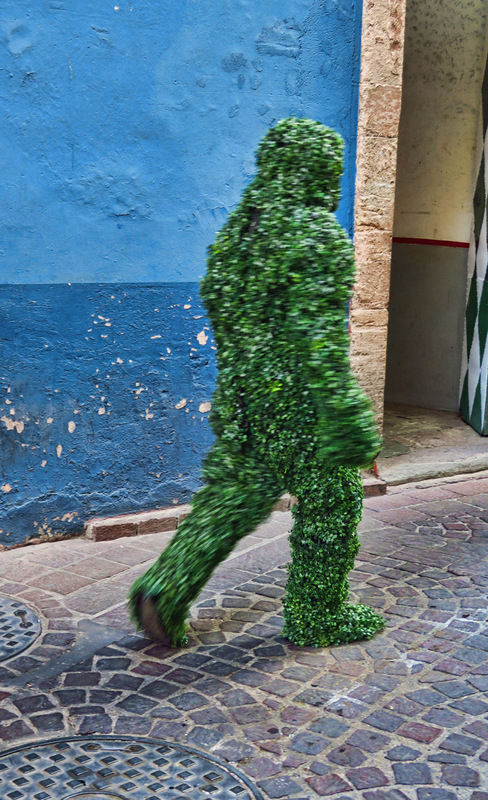 It took lots of deprogramming to learn that Monday mornings meant time to breathe a sigh of relief that the masses were back to work…and I was no longer one of them. So waking up for class on the first day feels a bit exciting, reminiscent of that “first day of school.” But it goes rapidly downhill from there. One of my favorite pastimes is to go to a coffee shop right after class. After early morning wake-up call, this helps me stave off the urge for siesta! 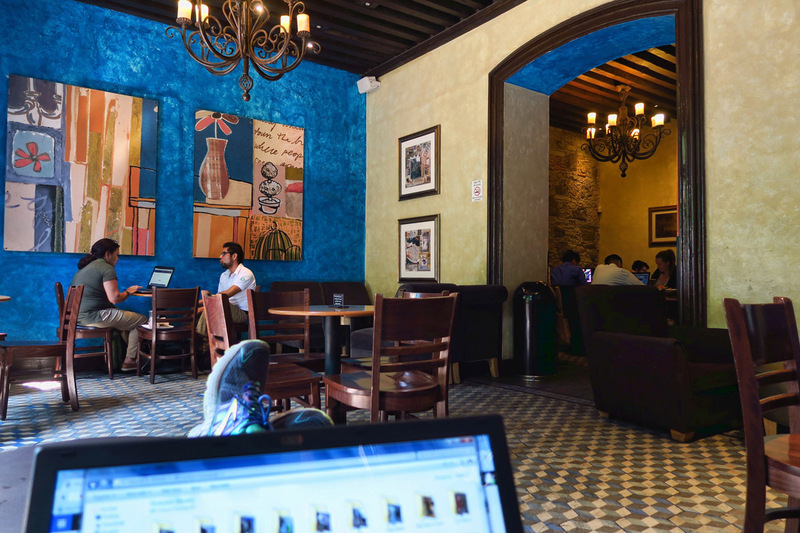 Guanajuato has many unique coffee shops. This one, La Vie en Rose, which has a room displaying magazines and travel brochures. Soon, the long early morning commute to La Hacienda makes my classes start to feel like an obligation. I start having dreams about my work days at American Express. I feel resentment in having to once again begin my day with something called an “ALARM!” I find that I don’t enjoy the one mile walk across the Centro in rush hour traffic, crossing a congested area where several of the tunnels converge bringing belching buses, hurried taxis, and a mish-mash of pedestrians to a crescendo. My morning commute takes me up along some extremely crowded elevated sidewalks, past stores selling carne and chicken feet. Between the smells of offal, the exposed sewer drain, and the heavily perfumed women on their way to work, it’s not a pleasant commute at 8:30am. But more importantly, I realize I am taking this way too seriously. I’m not having any fun. Much closer to mi casa is Escuela Falcon. Not as beautiful, but very convenient…and social. Newly found friends sharing conversation in Spanish on the terrace of Escuela Falcon. In my conversation class, we play many games which makes it easier to absorb than just reading a workbook. Consequently, I make the difficult decision to change schools, knowing it is going to cause me a bit of a set-back in starting over in the beginning class. This will make the fourth time in my life that I’ve sat through learning the days of the week and numbers one through a thousand. 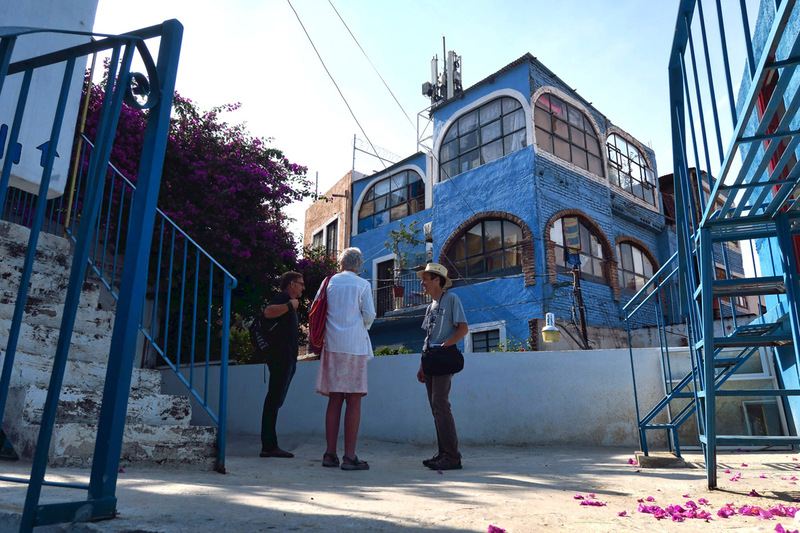 But the most painful part of all is having to go through the “De donde eres?” question again…“Where are you from?” Even though I have learned a wonderful Spanish term, “Casa Rodante” (motor home) it still doesn’t make the explanation easy in English, let alone Spanish. But I soldier through it once again as review in exchange for starting anew. 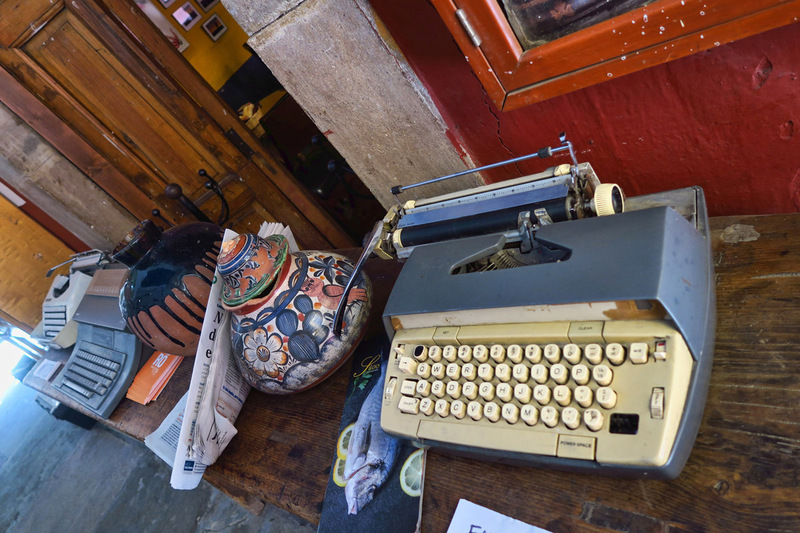 Antique typewriter on display at “Cafe Antik,” another of my favorite coffee shops. After poo-pooing Escuela Falcon’s “fluff” (cooking, painting, and Salsa classes) I decide maybe I could use a little levity after all. So I make the transfer to Escuela Falcon where I sign up for three classes per day…. 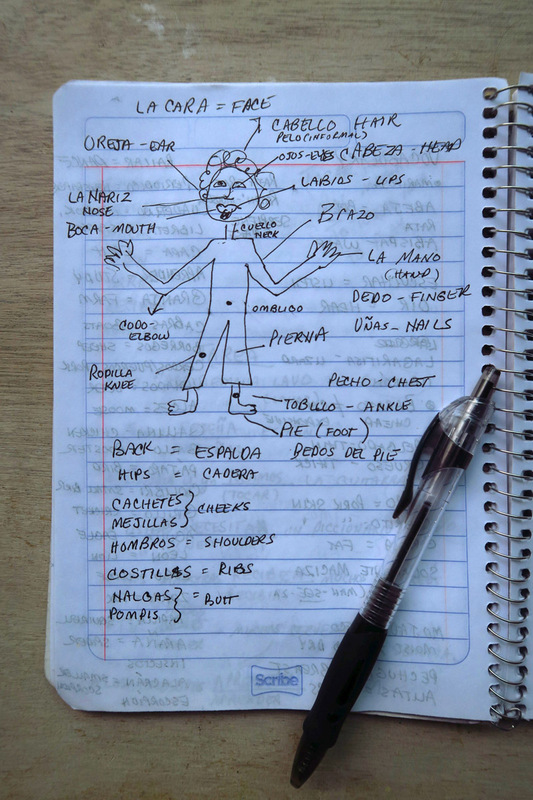 Grammar, Conversation/Vocabulary, and…that thing I said I wouldn’t do…La Clase de Cocina! 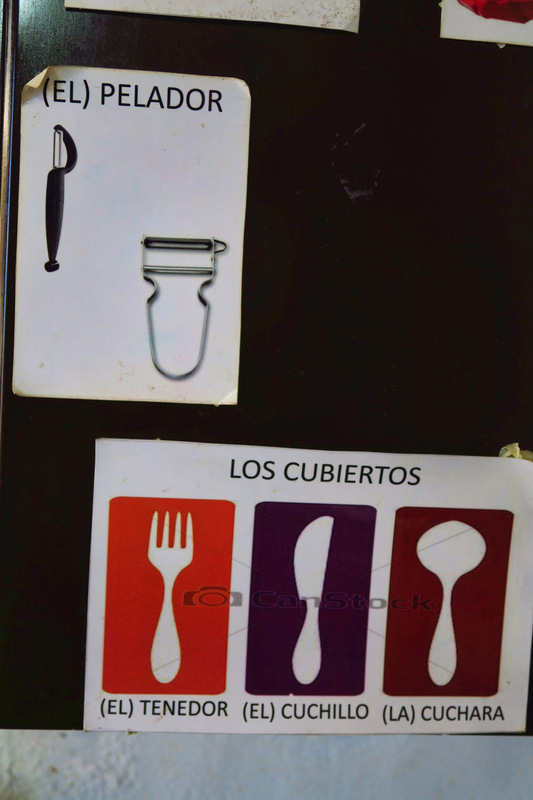 I am grateful that there are “cheat sheets” on all the cabinet doors. This is my instructor for cooking class. 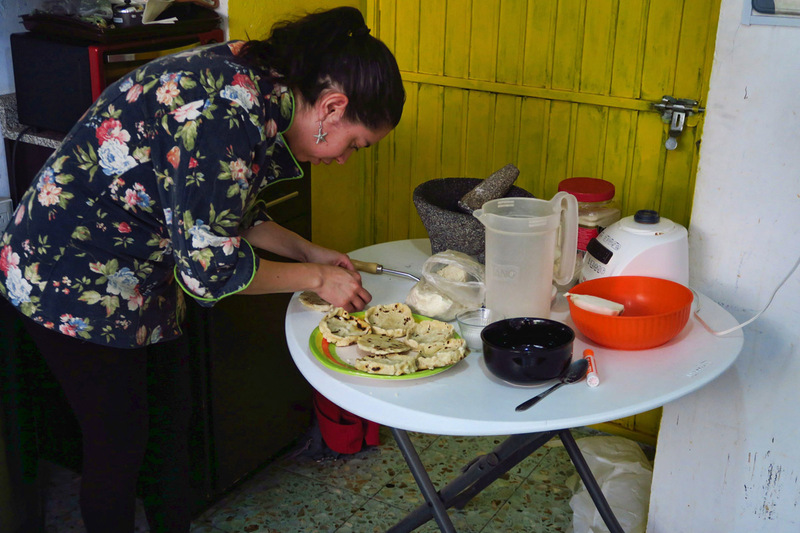 (mi maestra de clase de cochina) She is showing us how to make Sopes. 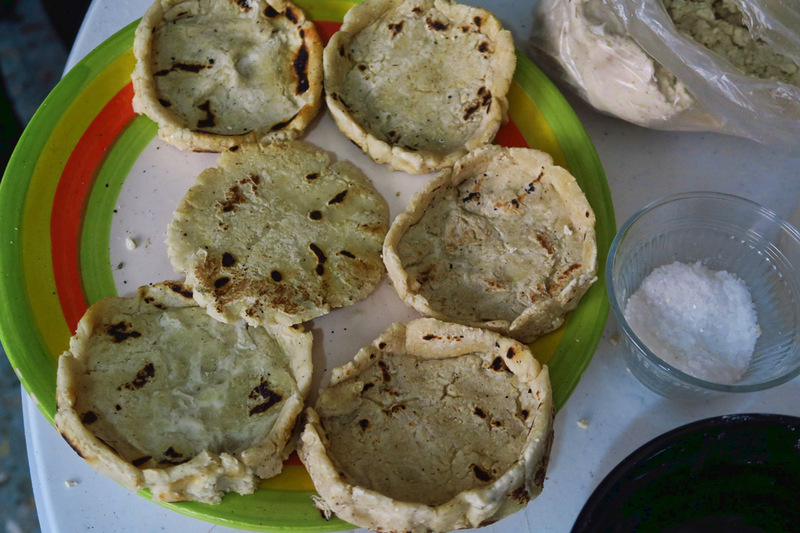 Sopes are like little pie crusts made from corn flower. They are grilled, then shaped while hot, then returned to the grill. 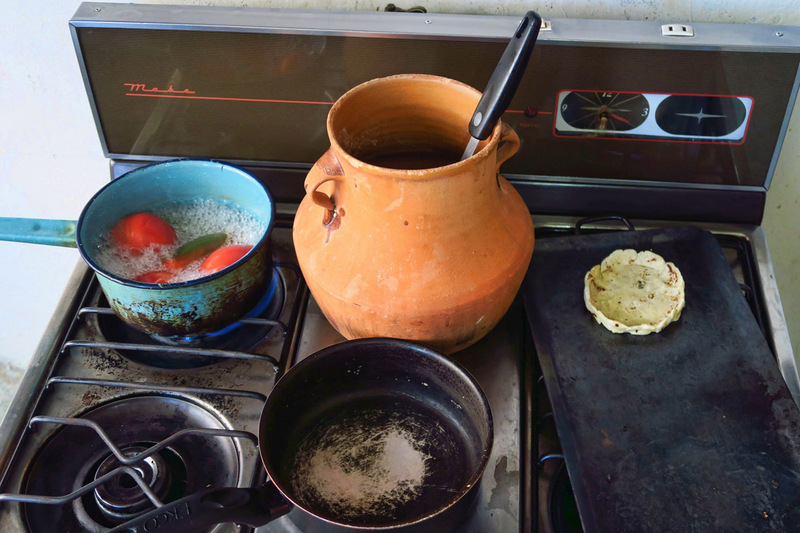 The griddle on the right is called a “comal.” The clay pot in the middle, or “olla” holds beans, which we will use to fill the sopes. It surprises me that these clay pots can be put right on the open flame. 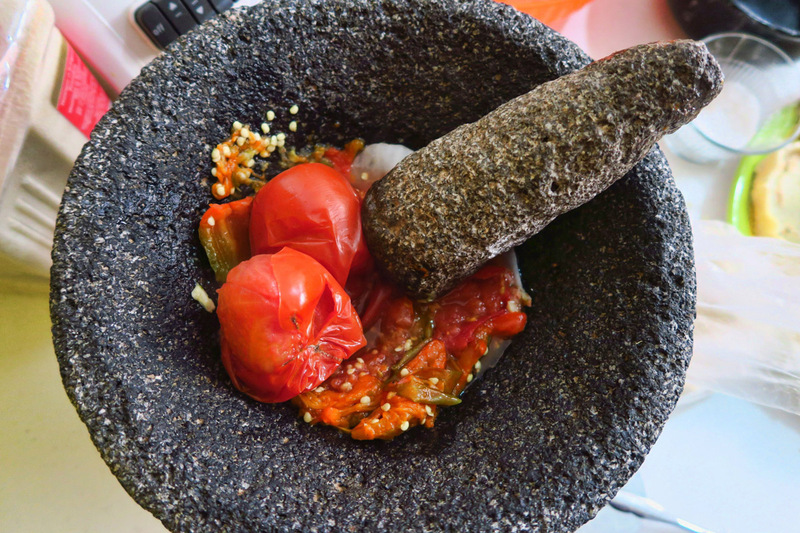 To top the Sopes, we make warm “Salsa Mocajete,” named for the stone mortar and pestle. First, we boil the “jitomate” (tomato) and jalapeno. Then while still warm, we grind them up with onion, garlic, and cilantro to make a delicious salsa. The best part about taking a cooking class is getting to eat the finished product, along with Aqua Fresca de Piña, or Pineapple water. 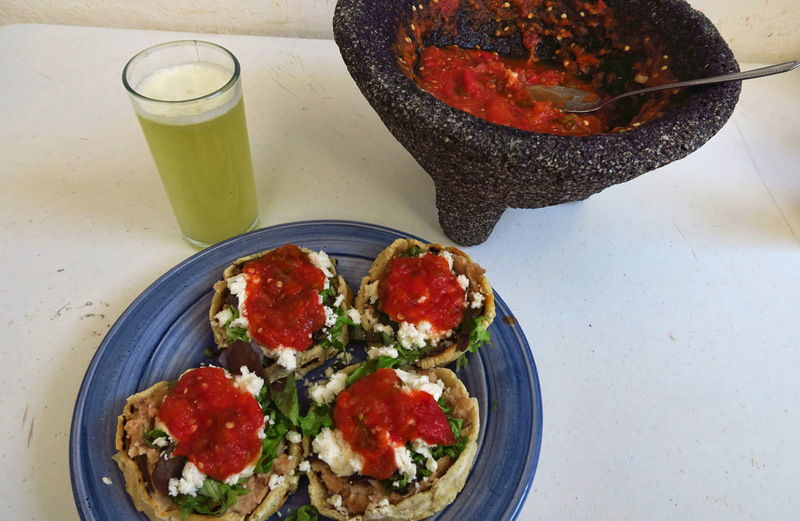 This entry was posted in Guanajuato, Mexico and tagged Cooking class, Escuela Falcon, Guanajuato, La Hacienda Spanish School, Spanish School by Suzanne. Bookmark the permalink. Really enjoy your blog. Thanks for sharing your nomad existence. I have future dreams of experiencing a lot of the things you have blogged about over the past few years. 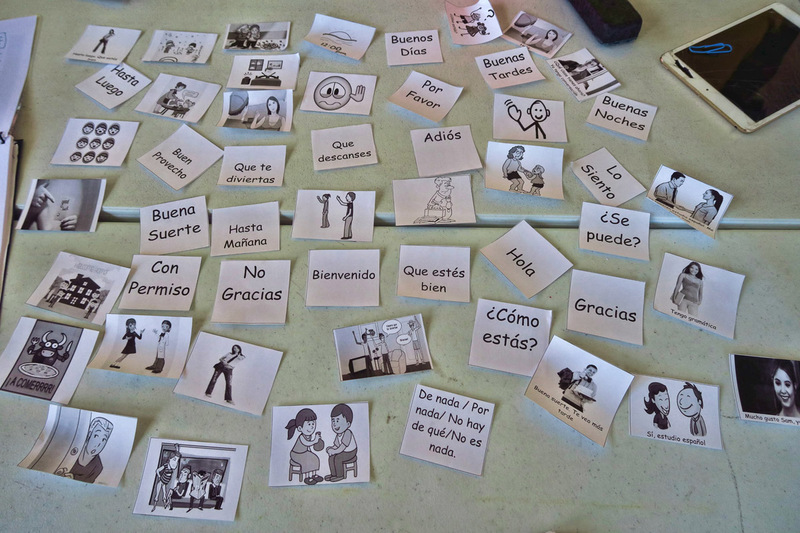 Question about your Spanish school, are the beginner classes geared towards people who truly know nothing more than “hola” or is the expectation that a student knows some basic vocabulary? I have started several times to teach myself conversational Spanish but can never get very far. Thanks for the question, Kathy, and for following along. 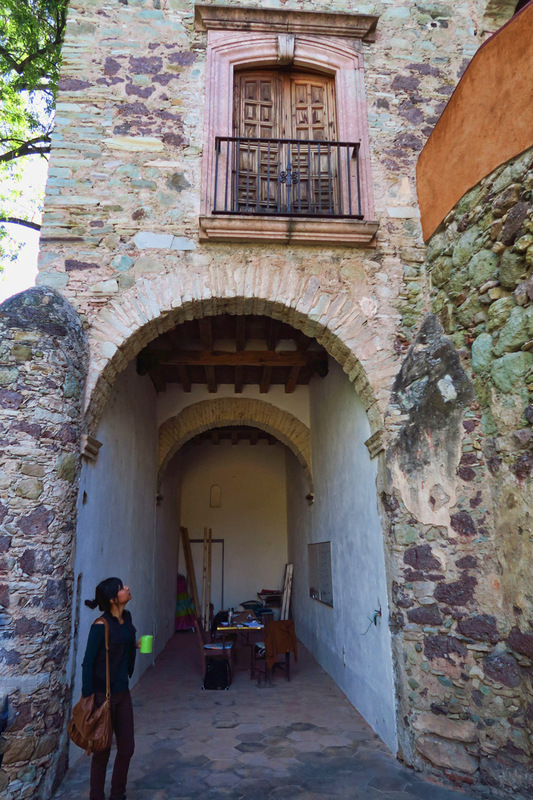 The classes are very small in Guanajuato, especially now that we are approaching the off season. With the exception of my cooking class which had three people, two is the most I have had in any class, and in fact, many times I have been the only student..a private class at group prices! They are really good at tailoring to the individual level, so if you need to start at “Hola!” they are willing to do so. They do offer a placement test, but if you want to start at beginning level, testing is not required. So interesting and the images are terrific. How is your Spanish coming along? I would think you have the first few days really learned, having taken them twice. Keep us posted on your progress, but please make it in English. Hi, Marilyn. 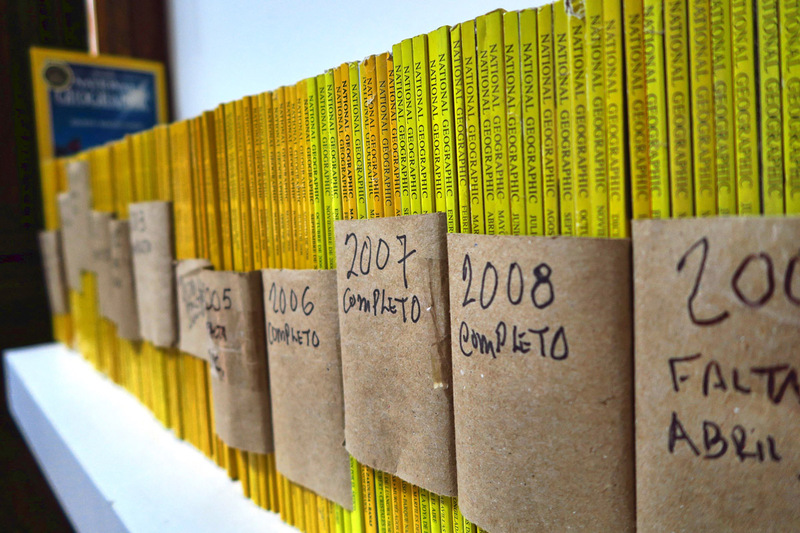 As all the instructors like to say, “poco a poco!”…little by little. I have a good solid vocabulary, but putting it together in more than a 3-4 word sentences is my challenge. I can read better than I can write, and I can write better than I can speak. Poco a poco! 😉 Thanks for checking in. Since you love your time in Mexico so much, I hope you have lots of success in your Spanish classes. It will be even more fun visiting if you can communicate with everyone:) I think the cooking class would be wonderful! Wish I was there with you Suzanne. So glad you are cooking, because to me, that’s true culture, along with music and language, and art. Viva Mexico! Work…that four letter word that signifies everything I left behind in 2012! I completely understand your feelings about school related to Work! “Work” , no matter how few hours a week, is the reason we have resisted taking a camp host job. I love following your travels! We’ve been retired for 10 years (me, actually nine) and we STILL can’t commit to being anywhere at a given time. I think all of those years of getting up way too early did something to our brains. The second language school looks really good, so does the cooking class. I love the mortar and pestle. In the US we would probably just get out the food processor. Congrats on taking the cooking class, too. As a reader commented, what better way to immerse yourself in the daily culture than food? In addition, it looks like you can learn to use a more complete Mexican pantry and cookbook – not just the Sonoran “sick on a plate” that comprises so much of what is on offer as Mexican in the USA. Hidden somewhere in Santa Fe NM is a restaurant that features (and teaches!) about the 7 regional cuisines of Mexico. It was a treat and an education when I was taken there in another life. And why would you be embarrassed to be caught in a Starbucks? It’s good and – the big challenge – consistent worldwide. I commend you on your initiative in taking these classes. We would love to learn Spanish but just don’t have the patience. 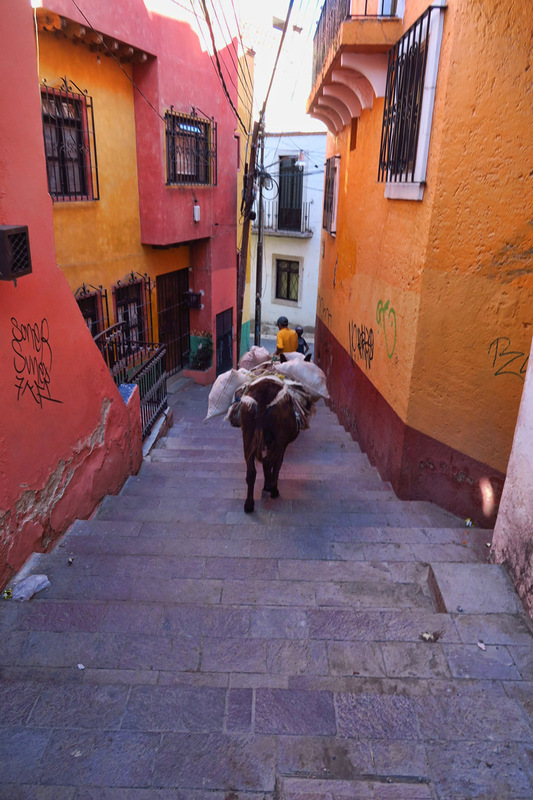 Are you still in Guanajuato? 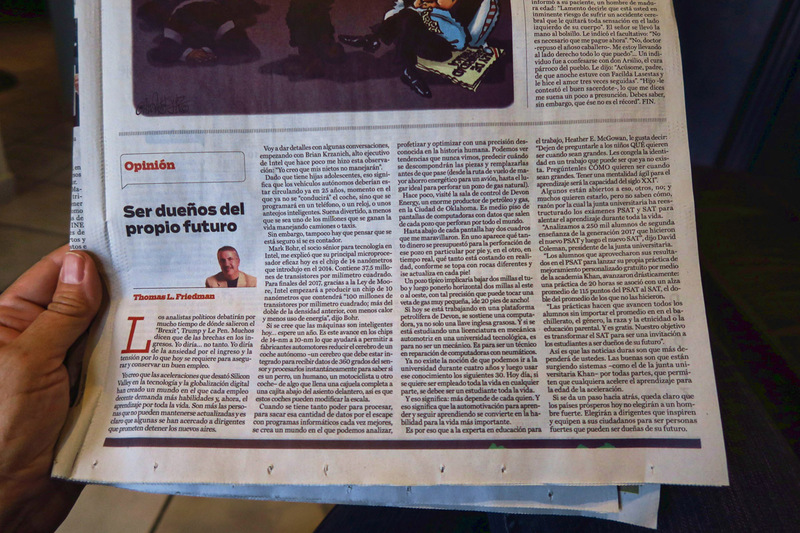 I’m just catching up on blogs after not having a computer for a week………..
I’m thrilled you’re taking Spanish. There is a FAB school here that the curriculum is set up for people over 40! It is a three week INTENSIVE course, but I can guarantee you at the end of 3 weeks, you know more and are able to more then from the other six schools I went to before that one………It is called Warren Hardy. His program is used by US Customs and others….. I am still here, but will be in SMdA next week for a few days. Will send you an email. It sounds like you made the right decision on many levels for changing language schools. I for one would love the inclusion of the cooking class. What a wonderful adventure you are having! 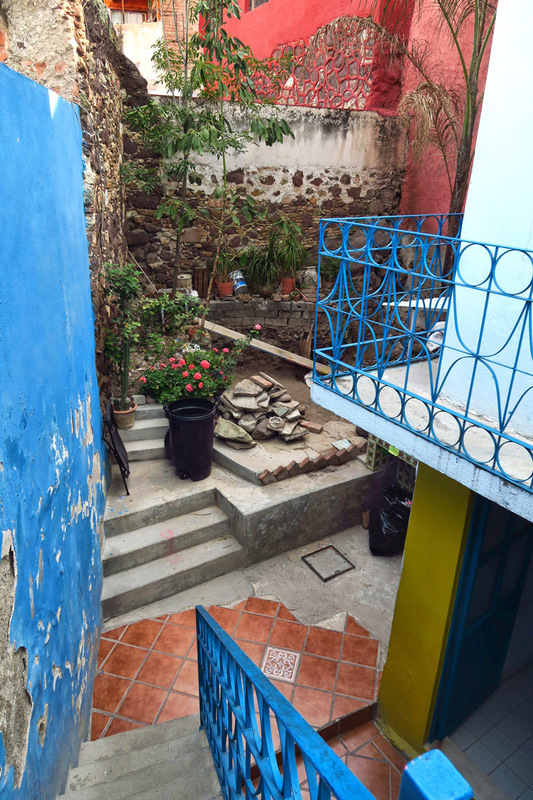 In all your Mexico posts, the thing I’ve noticed is the bright colours. I know as soon as I click on your post that I’m going to see lots of bright colours, in some new city in Mexico. 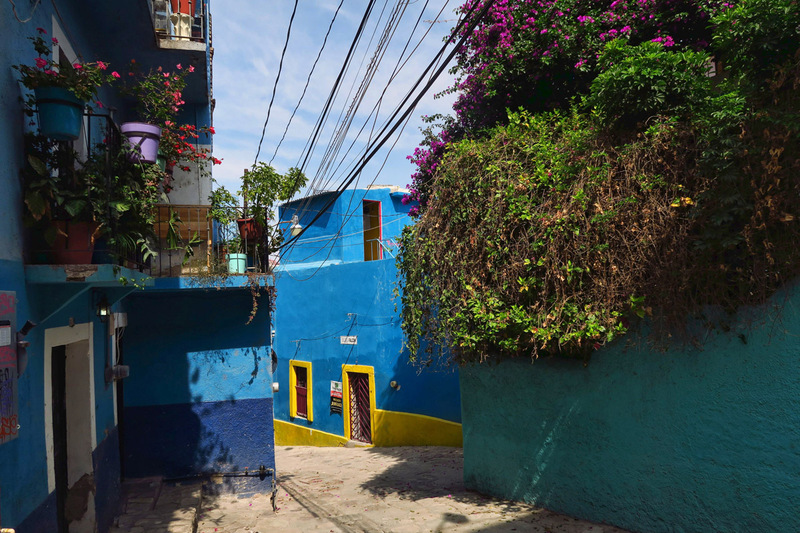 My very limited impression of the Mexican culture is going to be all about colours! I’ve just discovered your blog – thanks for sharing! I’m planning on taking 4-5 weeks of beginner Spanish classes in Guanajuato in November, and am actually tossing up between the two schools you tried out. I haven’t booked accommodation yet, so I’m not so worried about the commute, but am keen to get the best learning experience possible so I can progress as far as possible before I continue my travels! Did you have any thoughts from that angle? Was the teaching/standards of the two schools comparable, or did you have a preference? Any thoughts would be most welcome! Thanks for the question. I apologize for the delay in answering, but I have been in a Forest Service campground with no cell signal for several days. I would say that the answer is a tough one…Definitely Escuela Falcon was more fun, and offered a greater chance to meet people, particularly with their after class activities such as tours to the local museums and events. They also have more structured workbooks and hand outs. But I probably got a greater immersion from La Hacienda, particularly if you can get into one of Lewis’ classes. He begins speaking Spanish very slowly and methodically right from the get-go, so there is no hesitation to begin learning and speaking almost immediately. So it’s tough to say which is the better “experience,” more structured classroom materials at Escuela Falcon, versus more immersion from La Hacienda. Hope that helps. Let me know if you have more questions.